MARTINSVILLE, Va — Over three rounds of qualifying, Kyle Busch won the pole for the First Data 500. In the final round he had a best lap time of 19.673 seconds. 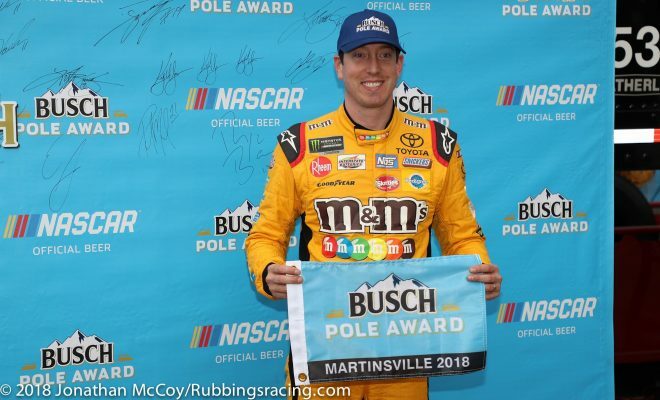 The pole was Busch’s 31st of his career, and fourth of the 2018 season. Six minutes into the 15 minute first round of qualifying, Darrell Wallace Jr. wheel hopped his No. 43 Pioneer Records Management Chevrolet. The rookie driver spun his car on entry, wrecking it against the turn three outside retaining wall. The qualifying session was paused for more than five minutes for the ordeal. Darrell Wallace Jr. wheel hopped and spun his car into the turn three wall during the first round of qualifying. Photo by Jonathan McCoy. Ryan Blaney was the fastest in the first round, he had a best lap average speed of 96.317 mph. Chase Elliott was the last driver to make the cut into the second round, he was 24th quick at 95.199 mph. 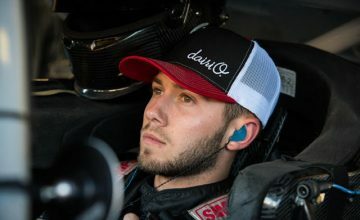 He beat Ross Chastain by 0.007 seconds for the final transfer position. Behind Chastain was Ty Dillon for 26th, Matt Kenseth 27th, Austin Dillon for 28th, Matt Dibenedetto 29th, and Regan Smith 30th. Landon Cassill didn’t make an attempt at a qualifying run but because only 40 cars are on the entry list for the 40 car field he’ll still make the show, albeit he’ll be starting shotgun on the field of drivers. The second round consisted of the top 24 cars from the first round, and lasted 10 minutes. Fifteen drivers posted a lap time in the first four minutes. Joey Logano was 12th quickest, the last to make it into the final round of qualifying. Kevin Harvick was 0.020 seconds slower than Logano, reserving him to a 13th place starting spot. David Ragan and Chris Buescher had notable qualifying runs. Ragan powered his No. 38 MDS Transport Ford Fusion to 14th and Buescher to 15th. Buescher’s teammate, A.J. Allmendinger was 17th fastest. Hendrick Motorsports had a mixed bag in qualifying. 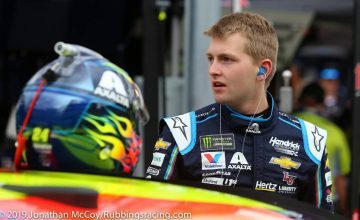 Elliott will start the first race in the round of eight from the 21st starting position, Alex Bowman will roll off the grid 16th, Jimmie Johnson will begin 23rd, but the rookie, William Byron was 10th fastest advancing him into the final round of qualifying. In the final round Hamlin was the first to post a fast lap. 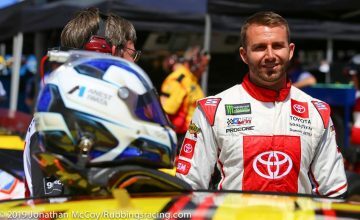 He stayed atop the leader board until Bowyer bested his lap with a time of 19.700 seconds. A few moments later Busch surpassed them both, averaging 96.254 mph. Blaney, who was eliminated from the playoffs last weekend at Kansas Speedway, was fourth quickest in the final round. 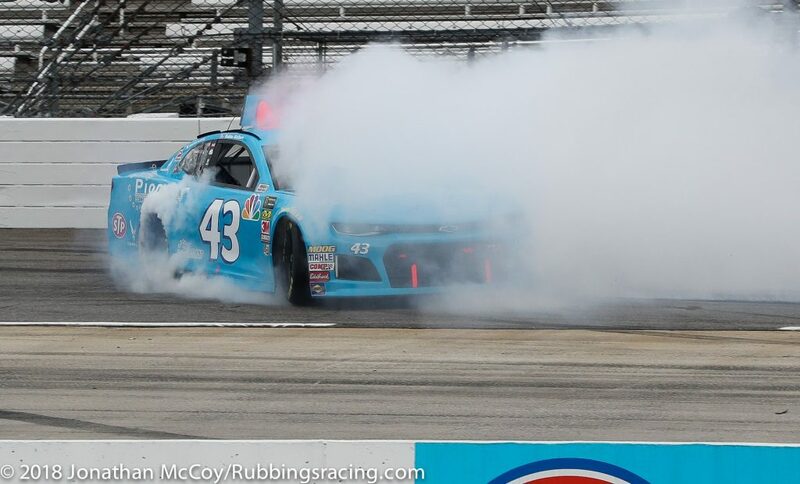 Aric Almirola, contending in the round of eight for the first time in his career, will roll off the grid on the inside of the third row, fifth. Last year’s MENCS champion, Martin Truex Jr. was sixth fastest while Kurt Busch was seventh quick. Brad Keselowski, Daniel Suarez, and Kyle Larson rounded out the top-10. Logano, the lone Team Penske car to advance this far in the playoffs will start 11th, and Byron will begin 12th. Sunday morning, Truex, Wallace, David Ragan, and Johnson all had their qualifying times disallowed for failing inspection.